Environmental Business Products (EBP) is Europe’s longest established and largest collector and remanufacturer of inkjet cartridges. Since it was established in 1992, the company has been at the forefront of the European cartridge remanufacturing industry and is recognised as one the foremost technical innovators in the industry. We specialise in the supply of high quality private-label cartridges for leading UK and European high street, mail order and web-based channels as well as major office supplies’ resellers. 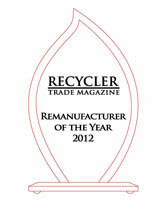 The independent trade magazine, ‘The Recycler’, named EBP as the number one recycler of inkjet cartridges in the world! The factory, collections processing centre, distribution centre and head office are based in Park Royal, North West London. The group’s sales currently exceed £30 million and we employ some 200 staff with operations covering the UK, France, Germany, Holland, Portugal and Spain. 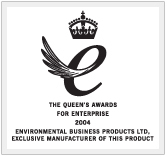 Awarded the Mayor’s Green Procurement Code Awards 2006 for areas including the purchase and use of environmentally friendly goods and the recycling and disposal of waste in an environmentally friendly manner. © 2019 Environmental Business Products Ltd. All Rights Reserved.